I'm popping in quick as a flash in the Brusho pan. No time to natter, waffle, or flibidolize! I know, more's the pity, but needs must and meeds lust and there's naught can be done for neither. It really is an embarrassingly simple design. I split the BSST with my die from Papertrey Ink and then bridged the split with a double-foam espresso vanilla sediment, also from PTI. The base card is strawberry slush from SU. 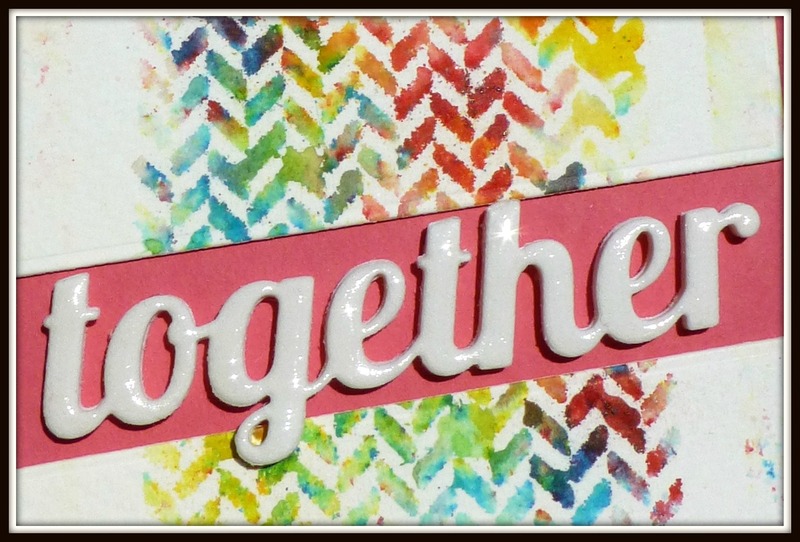 I used Mod Podge Dimensional (like glossy accents) on the word to allow it to stand up against the vibrant rainbow colors. I really toyed with adding some sort of embellies for and aft of the word, but in the end, I just decided to leave well-enough alone. I think this will make a sweet wedding or anniversary card or even a heartfelt friend-to-friend-I've-got-your-back card. The Card Concept: The Rainbow Connection. My concept is "clean and graphic." Diana lives in North Carolina so that is where this dragonfly/grasshopper/bug appeared. I am mesmerized by the neutral (yet striking) coloring, those feet and stockings, the hairiness all over, and that incredible backpack! Can you help identify this creature? 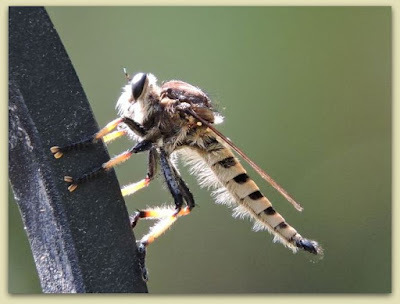 Edited to add: Several readers have properly identified this as Asilidae or "Robber Fly," an appropopo name considering the robber's bag it has on its back and the mask it wears! It lives everywhere in the world except Antarctica! It is harmless to humans, but is considered a "killing machine" to other (often beneficial) insects. Boo hiss, bad bug. As always, thank you for coming by to visit the Playhouse and special thanks to you if you take the time to join as a follower! Please let me know you came by, so I can be sure and return the flavor. Great BSST! No, my flobbers didn't fly out....lol but I do love the brightness, along with that word die I hadn't seen before! The bug? Can't identify it, and frankly don't wanna.... I saw a Black Widow today, that was enough for me! Hi Darnell, Loving the brightly coloured card. I agree with Jane, it's a Robber Fly. FABBYLISCIOUS make from you again today, Darnell. Love the audience participation photo too. Who knew there were so many alternatives to Glossy Accents? I was using mine (Plaid dimensional gloss) yesterday .. it dries so much quicker than G.A.'s! Love the rainbowcolours! Yet another beautiful Brusho-card! Enjoy your week! Ooooohh what a wonderful card Darnell - love the vibrant colours and the great stenciled design, with the simple but bold sediment. That wonderful wee critter immediately made me think of a mosquito!!! Oh yes Darnell, I am a colour lover and absolutely love your fusion of colours on this card. Can't help with the inspect I'm afraid, we certainly don't get anything that exotic or beautifully detailed here in the UK. WOW! What a fabulous coloured Brusho panel ..... so vibrant. I love the rainbow colours of this gorgeous brusho creation Darnell. It does not need anything other than the sentiment. Terrific card and love the shiny sentiment ... I had to read the comments to see what that creature was ... Yikes! Glad I've never met one! It's a great card without embellishments! 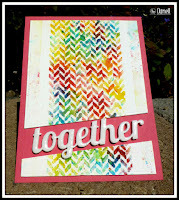 Fab brushos background with your stencil and recycled towels and the 3D mod podge really makes your sentiment pop out!!! Gorgeous rainbow colored card created to perfection! No clue on the critter, but it looks beautifully creepy. I read the comments and have never heard of it. Fascinating on both topics! Have a great week! This is so bright and cheerful. I love the shiny sentiment. Beautiful card! I love the brightness of the rainbow colors and the pretty stencil. I think a simple layout is just what it needs! Gorgeous CAS card, as always, Darnell. Love the hint of gloss on the sentiment. What a cool effect from those Brushos. Love how you have your sentiment on the die cut diagonal. And, eek--don't know what that bug is, but PLEASE keep it away from me!! I can't identify the bug but I can identify a FANTABULOUS card when I see it!! Wonderful background Darnell!! Do "they" ever catch you hugging your Brushos? I think I would if I had that amazing product! So glad you used this gorgeous stenciled background...and thing the way you used it, simply, with the diagonal sentiment for interest, is perfect. Doesn't need anything because of all that delicious and glorious color. Have no idea what kind of bug that is. Probably has a long, drawn out name like Fayetteville Zebra Striped Hump Backed Sap Sucking Cicada, or something just as ridiculous, poor little thing. such a very super brushos background to this card. It looks very lovely and vibrant. Great designing as always, and the words really pop as well. Love abd big hugs from my house to yours. Love the brightness of your card, gives me a warm happy feeling. Awesome use of the paper toweling. And, great colors too! Absolutely stunning card Darnell! 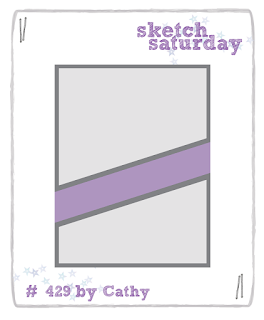 Like the bright cheery colors and it is perfect for the sketch! Your card is fantastic! Love this rainbow of colors and they definitely work together! And this insect is Asilidae or Robber fly. We've seen one this summer here, in California, it was really huge and caught a dragonfly for lunch. Honestly, I was scared of it. Gotta love the pretty colors of Brusho! What part of NC does your sister live? Is it close to Wilmington? Haven't seen that insect before, but is it possible it has another bug on top of it? What a gorgeous unique piece. Love how you created a card from it. Such a gorgeous card, Darnell! Love the gorgeous colours! That is a cool fly photo too! I find insects fascinating too! We get some very strange moths here. 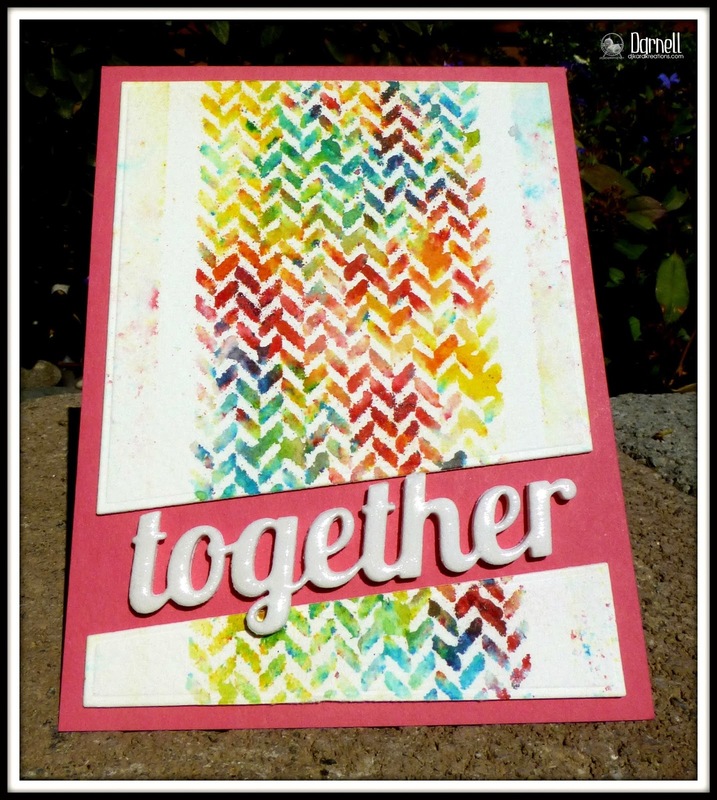 Love this bright, rainbow hued card! Great idea to split it and add that shiny sediment! That is certainly not one of our prettier bugs! Cool card Darnell!! This hairy mask wearing backpack carrying bug might not be harmful to humans, but I wouldn't want to meet one face to face!! I love the colors on this card and the way they meld. See you've found a way to add a sentiment without covering up the Brusho art. Awesome card, Darnell! I think it looks great with no further embellishment. The bright colors of the Brushos add enough colorful interest, me thinks. Yes, I love colors and feel personally addressed by your greeting! This card is real eye candy and doesn't need anything else but this gorgeous background cut at an angle with the die cut word. Not too simple at all, my dear! Darnell, This is one gorgeous background and a fabulous sketch interpretation!!! Great close up photo of the bug. I don't really want to see one say on me, but a photo is fine. Your cards is awesome and perfect the way it is. You were so right to stop in the name of love... I mean stop before it got too cluttered up. Perfect is a perfect does or something like that. Love the split panel, and that bug is rather handsome. What a unique card this i. I love the bright colors and sometimes simple is best. It has it's own look and shine and is so pretty. As for bugs, I'm not a fan. I hope it doesn't want to come here and rob us. Am so loving these brusho towel blotting backgrounds, and splitting the design as you've done, super effective. It didn't need One Other Thing to show off the gorgeousness! Love these hot bright colors too. TFS & Hugs. I am swooning over this. 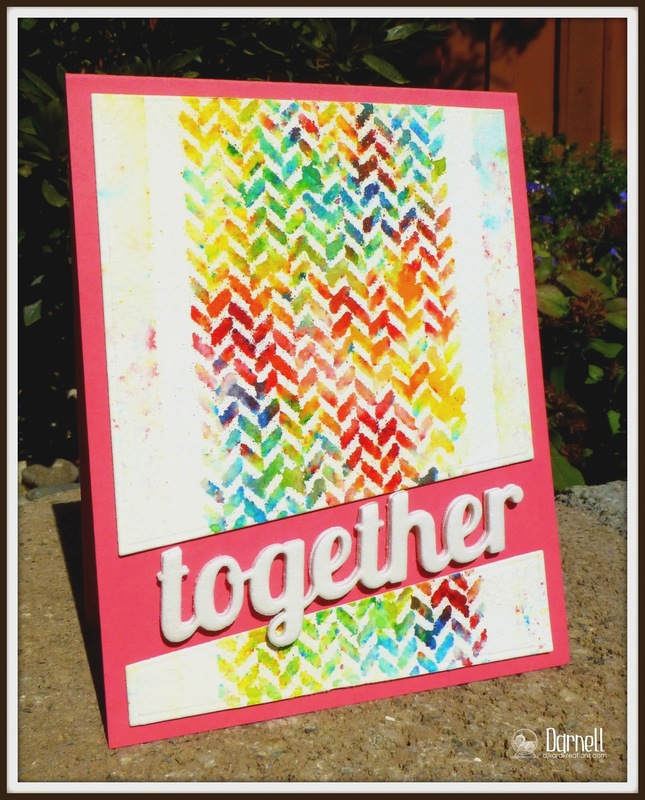 I LOVE the rainbow stenciled colours - so so pretty! I am definitely going to have to try this technique. LOVE LOVE LOVE! Amazing how you got those bright colors to blend without getting muddy! Beautiful, Darnell! That sketch was a great way to highlight this beauty! Oh, how pretty. Love that amazing stenciled background. 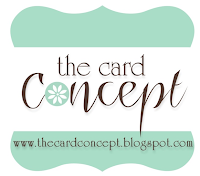 So glad you could join us for the Card Concept challenge. Fascinating about the fly, ugh. Really lovely way to use the brushos, I do love the way you build up the texts and use the negatives of the die cuts, I must learn from you. I sit at your feet. And now, I want brushos and all this time I thought I didn't. !!! Darnell, this is a very special creation. I love the way you used the colours! Oh that Brusho!! What fabulousness!! And how clever to add the shine to your sentiment. Your post just made my day....thanks for the smile. (except for the bad bug....because he was super cool until he was bad) So glad you joined us at The Card Concept! You and your Brushos appear to me have much lust with one another; this card is absolutely stellar with its vibrant colours and cool 'split'! Your bug....ewwwwwwwwwwwwwwwwwwwwwwwwwwwwww! That is all! WOW Darnell it is so beautiful ! I just had a look on the internet to see what Brusho was. I didn't know about those pigments, and now I understand better how you enjoyed to work with them. Oh no ! Another thing I'd like to try and which goes on my wish list (already as tall as my arm !) That's what I love when I read all the blogs, I always discover new artist, gorgeous creations and new techniques ! It's an endless experience ! Thanks for sharing with us ! Hugs. I love this one, I must have seen it on FB never know where I leave comments these days,Instagram,FB or blog! Love the colors on this neat textured card!